We believe that desirable human resources are those who can contribute to society, or more specifically those who have problem-solving ability, challenge difficulties, find solutions and create new values. 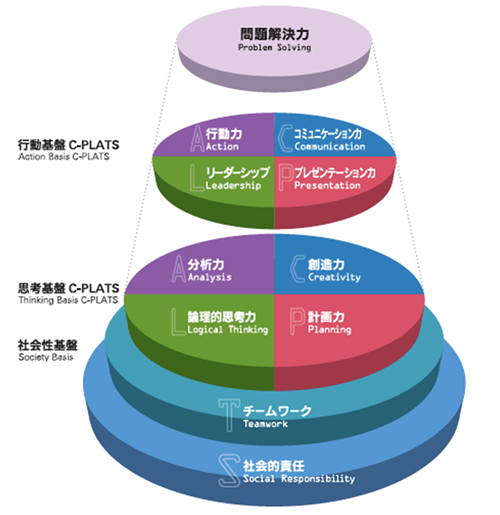 Otemae University developed our original educational program, C-PLATS, in order to foster those people, especially focused on nurturing problem-solving ability. Problem-solving ability is considered essential to succeed in society irrespective of career choice or life path, because all human endeavors are series of problem-solving activities. C-PLATS breaks down problem-solving ability into 10 competencies (communication, presentation, leadership, action, creativity, planning, logical thinking, analysis, teamwork and social responsibility) and each of these competencies are divided in 10 stages, so that students can understand and visualize what kind of competencies they acquire and how well they are doing in their ability-building processes. All courses in Otemae are designed to cultivate those 10 competencies most efficiently. Students can develop problem-solving ability, while studying whatever courses they may choose for their interests or career plans. In PBL+SDL methods, students are always at the center of learning. Students themselves find problems or topics, do research, analyze, think logically, find solutions, write papers, prepare materials for a presentation, and have a debate or discussion in classroom. This is what we call PBL+SDL. Although teachers may give students advice or guidance, students are always leading players. All courses offered in Otemae include PBL+SDL as well as conventional lecturing sessions in a well-balanced manner. Therefore, students can develop 10 competencies needed in society by just attending classes of their own interest and choice. An accumulation of PBL+SDL leads students to develop abilities to act. Our goal is to create men and women of action who can get things done, not simply knowledgeable people who know things.